Mingleview free remote desktop sharing is another tool to remotely connect to the users desktop. This software has many new features over its competitors like first application with unlimited participants. It does not require installation and also gives you HD Quality of video and gives Secure peer 2 peer connection built over SSL. 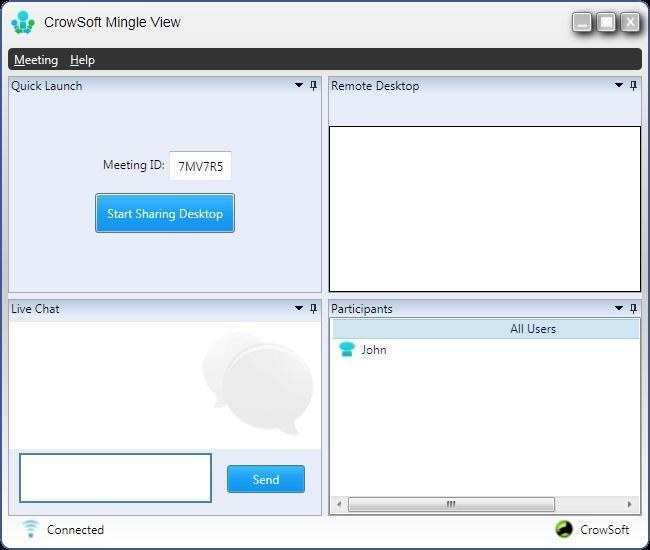 Mingle View is a free peer-to-peer (P2P) remote desktop sharing and control based application which enables remote assistance and hosting of online meetings and presentations with friends, family and colleagues at work no matter where you are. Join a meeting and troubleshoot any PC with a simple 6-digit meeting ID. Unlimited Participation: The first ever truly free remote desktop sharing application offering unlimited access to users to host and or to participate in meetings with unlimited participants while at the same time protecting them from unnecessary pop-ups and annoying e-mail registrations. HD Screen Quality: Exceptional 24-bit color quality helps simulate a rich and lively experience of working on the actual PC. Security: Secure P2P connection built over AES encryption. Screen sharing security powered by VNC.